Maurice Cardiff, the army officer who ran the council temporarily before Runciman arrived, recalls him vividly dealing with his improbable staff as they all gamely muddled through. ‘He had two kinds of yesses, one short, even clipped, was a true affirmative; the other, long drawn out with a dip in the middle, signified “no”. The distinction was lost on Paddy, who on the strength of the longest of drawn out “yesses” would set out on a six-week tour of the islands or a trip round the Peloponnese.’ No doubt Runciman was not displeased to have Leigh Fermor, always something of a loose cannon, out of the office for a while. This entry was posted in Paddy's Friends and tagged Athens, British Council, Maurice Cardiff, Steven Runciman on October 21, 2016 by proverbs6to10. Maurice Cardiff worked in the SOE and headed-up the British Council in Athens after the War which is where he first met Paddy. It was the start of a life-long friendship. In 1997 he published “Friends Abroad: Memories of Patrick Leigh-Fermor, Lawrence Durrell, Peggy Gugenheim, Freya Stark and Others” which is an first class read. Maurice Cardiff combined long service with the British Council with a parallel career as a writer. As “John Lincoln” he was the author of books including One Man’s Mexico (1967 – modestly subtitled “A Record of Travels and Encounters”), which was described by Graham Greene as “the best book on Mexico this century”. Cardiff worked for the British Council from 1946 to 1973, during which time he was posted to Greece, Italy,Cyprus, Mexico, Belgium, Thailand and France. For a compulsive traveller, endowed with infinite curiosity and acute observation, it was the perfect job. As Cultural Attach to the British Council he enjoyed the advantages of both diplomatic and academic life, without the formal restrictions of either.The youngest son of an army officer, he had been brought up in Herefordshire and educated at Eton, then Worcester College, Oxford. He fell in love with a young actress called Leonora Freeman, and since his parents disapproved of the match they eloped to Gretna Green and were married in April 1939. He was 23. They spent their honeymoon in Greece, where he began to learn Greek. When war broke out, he joined his two elder brothers in the Scots Guards. Cardiff’s knowledge of Greek brought him to the attention of SOE (the Special Operations Executive). He was attached to the Political Warfare Executive in Cairo in 1943, and he spent the last months of the Second World War working with the Communist resistance in the Aegean Islands. When the Greek army retook control, Cardiff was told to report to Athens, where Colonel Kenneth Johnston wanted to see him. He had known Johnston while training in Cairo, but was not prepared for what followed. As Johnston emptied his desk, he briefed Cardiff on the aims and management of the British Council. At the end of an hour Johnston got into a car and drove away. Cardiff was left in sole charge of the British Council’s branch in Athens. The “British Committee for Relations with Other Countries” had been established in 1934. Two years later it was renamed the British Council and in 1938 it set up its first overseas operations in Egypt and Portugal. Its purpose was asserted in its Royal Charter of 1940 as promoting a wider knowledge of Our United Kingdom of Great Britain and Northern Ireland and the English language abroad and developing closer cultural relations between [the UK] and other countries for the purpose of benefiting the British Commonwealth of Nations. Cardiff’s first task was to find a building to house the council’s activities, and make it ready for the staff who arrived a few months later. Among them was the young Patrick Leigh Fermor: still unknown as a writer, but idolised as a war hero throughout Greece. 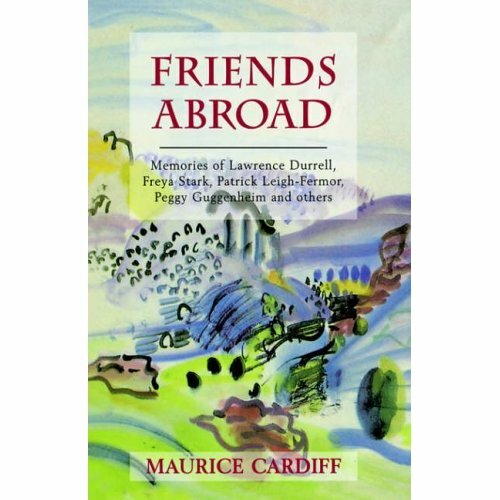 They remained friends for the rest of their lives, and Cardiff’s memories of Fermor appear in his last book, Friends Abroad (1997). All his working life, Cardiff spent as little time as possible with the ex-pat community that orbited round embassies and country clubs, preferring to forge links among the writers and journalists, musicians, artists and teachers of whatever country he was in. He took great satisfaction in promoting young talent, and helping them organise courses of study, concerts or exhibitions in England. His favourite postings were the farthest-flung, those that gave him a degree of freedom. He was not so happy in Brussels or Paris, where the social round was relentless – in Brussels he even became a vegetarian for a while, to spare his overworked digestion. It was also his job to welcome and entertain British artists passing through – though they weren’t always British. On one occasion, Cardiff discovered that Louis Armstrong was coming to Italy, and nothing had been laid on to welcome or celebrate his arrival. He immediately arranged a party of Italy’s finest musicians, all eager to meet the great man – who even sang a few songs towards the end of the evening. When not in his office or entertaining Cardiff travelled as widely as he could, as often as possible. He never kept diaries as such, but into a succession of notebooks and poems he poured the full range of his interests, his curiosity and his observations. The notes became books. Heaven for Horses (1957) was a novel about post-war Italy’ he described his wartime experience in the Aegean in Achilles and the Tortoise(1958). All the books he wrote in the course of his professional career were published under the pseudonym of John Lincoln. Only the later Friends Abroad, subtitled “Memories of Lawrence Durrell, Freya Stark, Patrick Leigh Fermor, Peggy Guggenheim and others”, appeared under his own name. There he recalls how the art collector Peggy Guggenheim – although fabulously rich – appreciated the scrupulous equality that he brought to their friendship. Cardiff insisted on paying his way, and often had her to stay (though he did have qualms about her sharing their bathroom in Cyprus with his three small boys). Perhaps his most successful portrait is of Lawrence Durrell. He was a genial man, and excellent company’ but Cardiff saw a destructive streak in the way he treated his wife Eve’ over time it alienated Durrell from most of his friends and family, and eventually destroyed him. In retirement, Cardiff and his wife settled in Oxfordshire. They continued to travel, but not to their old posts – they preferred new ground, which included Tibet, India and Ceylon. Cardiff had had a keen interest in Buddhism since his friend Osbert Moore rejected the world and retired to a Buddhist monastery -a strange, uneasy story that makes up the last chapter of Friends Abroad. Leonora died in 1997, and, six years later, Cardiff had to suffer the death from leukaemia of his middle son, David, a media historian, who shared his father’s love of poetry. In Maurice Cardiff’s last months he moved to London, to Highgate, where, despite increasing illness, he remained independent and self-reliant till the end. This entry was posted in Other SOE Obituaries, Paddy's Friends and tagged Athens, British Council, Freya Stark, Greece, Patrick Leigh Fermor on October 28, 2010 by proverbs6to10.